The University of Illinois Springfield’s Illinois Innocence Project (IIP) recently announced the creation of the IIP Latino Innocence Initiative to address wrongfully convicted Latinos. “Almost 14 percent of Illinois inmates are Latinos who are often wrongfully convicted due to unique barriers involving language, citizenship, and status,” said Executive Director of the Illinois Innocence Project John Hanlon at a press conference. “We hope to address these disparities which often lead to improper convictions and create difficulties for Latino inmates through working on their cases, encouraging understanding of the reasons for their treatment, and developing a reform agenda to minimize such wrongful convictions.” Senator Durbin, last week, announced a federal grant award for IIP to focus on cases involving wrongful conviction of a Latino where DNA might result in release. As part of the grant, IIP will hire a bi-lingual attorney in the Chicago area to work on those cases. “This is an important step in helping those Latinos who were convicted, but are innocent,” said Angel Gonzalez, IIP’s latest exoneree, who faced wrongful conviction over 20 years ago. For more information about the Illinois Innocence Project, visit www.uis.edu/illinoisinnocenceproject/. 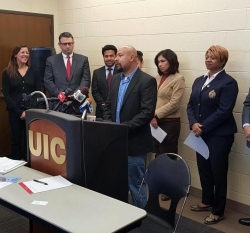 Photo Caption: Illinois Innocence Project Exoneree Angel Gonzalez addresses the media at a press conference on Nov. 13, 2015 in Chicago. Angel’s desire to reach back in to help other innocent Latino inmates inspired IIP to launch the Latino Innocence Initiative.